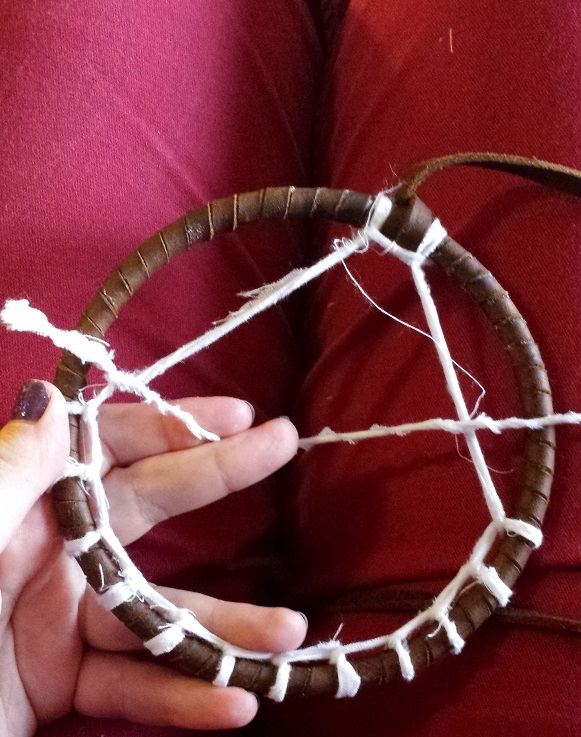 This game has dream magic, and one of the basics of it is the building of these dream catcher like charms that hold things important to the dream mage. 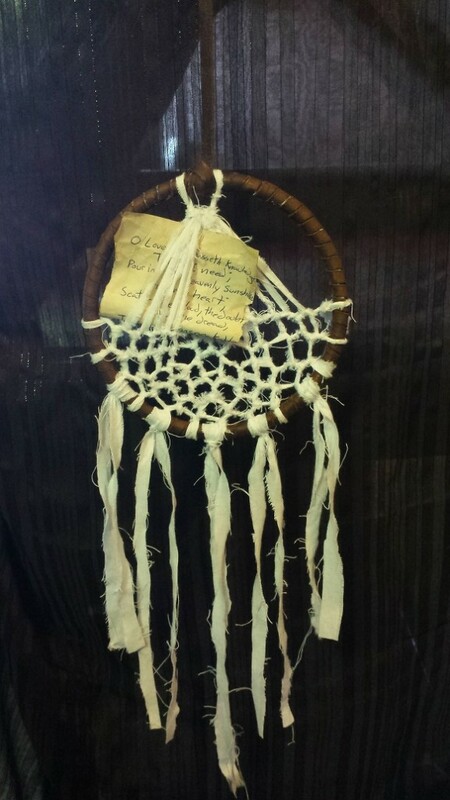 Unlike what little I know about the traditions of real dream catchers, these do not catch nightmares and let good dreams pass through. Instead a dream mage builds it with symbols and trinkets of the things that are important to them for two purposes: First, to act as an anchor to reality when the mage goes dream walking. And Second, as a means to draw strengths, tools, and even other people into the dream with the mage to help them. To start off the shebang, let’s talk materials. 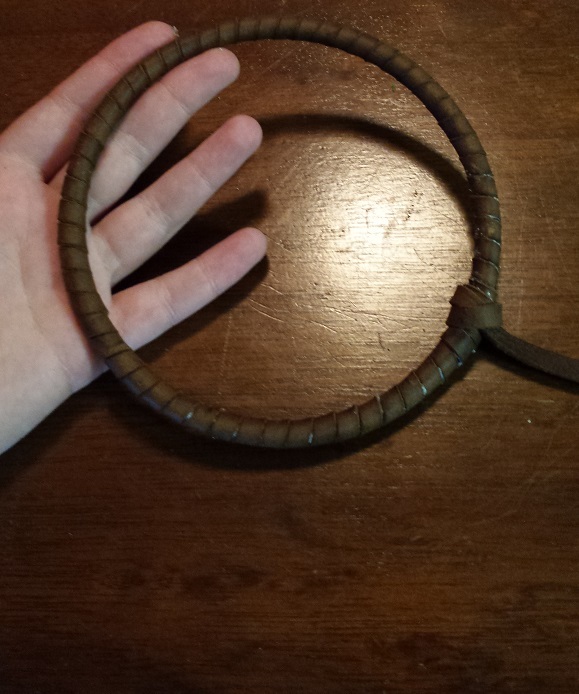 I used a 5 inch hoop, some kodiak tanned leather (about 1/4 inch strips), and 1/4 inch strips of thin muslin. 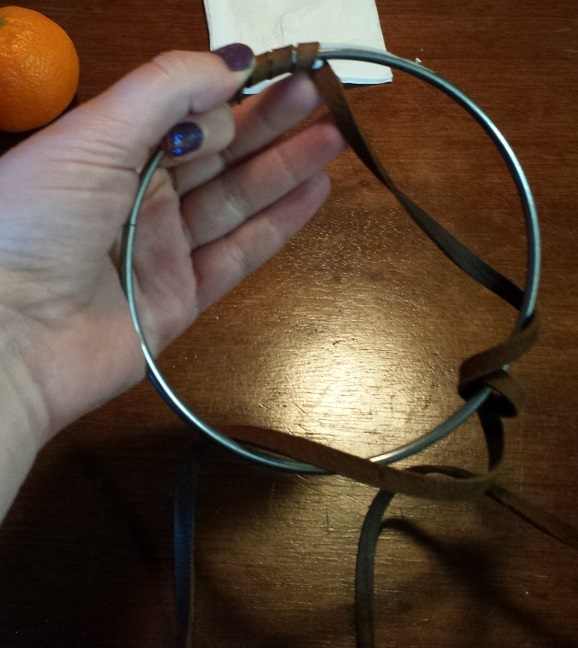 The leather and the hoop make sense, but why cloth strips you ask? Why not sinew, or embroidery floss, or something pretty? Well, that has to do with the fact that this is a prop for a specific character. Were I just making a pretty bauble for myself, I would have gone with one of those other options. The muslin is to stand in for fabric cut from another prop: a handkerchief embroidered by the character’s lost love. Above you can see a bit of the glue I used. Eventually I was using wooden clothes pins to hold things in place while it dried, because I have no patience to sit there and hold it myself. You can also see the mess of tangled cord starting to build up. This was taken before I got sense and started pulling the leather all the way through every time. The rest is pretty self explanatory. Still some glue peeking out that needs to be cleaned off, but otherwise I’m really happy with this. Setting up the pattern, it’s really just a series of switchbacks. I think this was five or six switchbacks. I think this pattern would really look better with a thinner thread at this size. 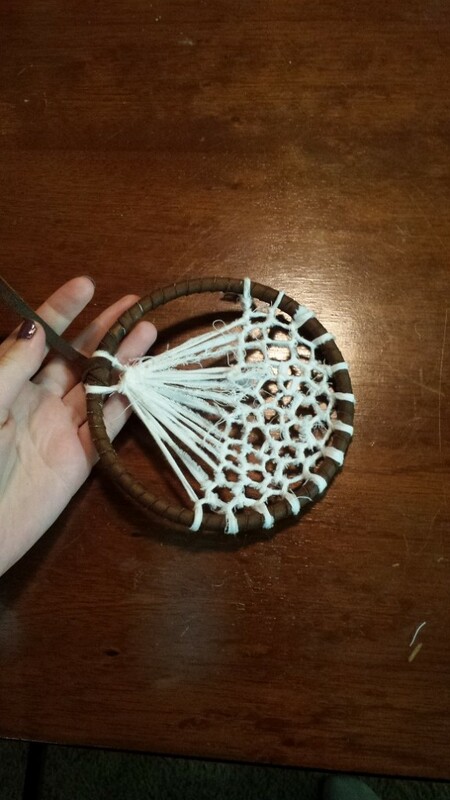 alternatively the cloth strips would probably look rad on a hoop at least half again as large. This basically finished the main body of the charm. All that was left was to weave in a trinket or two. So, the crumpled strip of paper has some religious poetry on it that resonates with the character, and is going to get a quick dip in a coffee bath to make it look a touch less like modern paper. That turned out great, it imparted just a touch of translucency to the paper, but didn’t make the ink run. 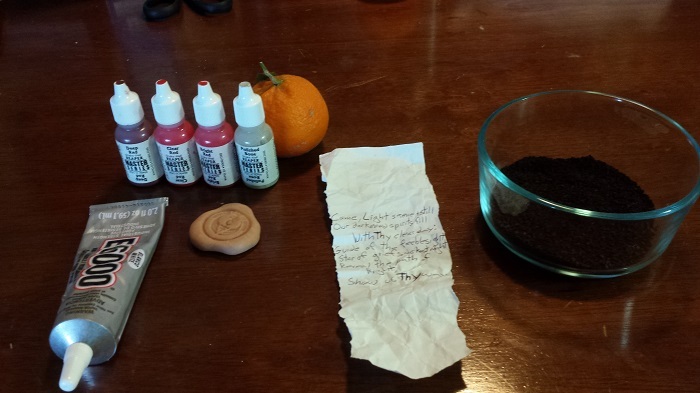 I also have a false wax seal made from sculpey there on the left. It was supposed to end up a shiny waxy red, and affixed to the scroll, but there were some technical difficulties. Namely my primer is way too sticky, and getting a good even coat of the red ended up making it far too matte. I’m going to be seeing if a spray on clear gloss coat fixes my problems, but for now the seal has been struck from this prop and I’m trying to think of something else to put it on. That’s it really. This was a pretty quick simple build, though I may add more photos after it’s been in play for a while. The Character using it is likely to be receiving gifts from others to put into the piece. I’m curious to see what it looks like a year from now.